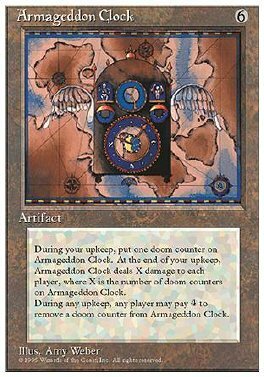 At the beginning of your upkeep, put a doom counter on Armageddon Clock. At the beginning of your draw step, Armageddon Clock deals damage to each player equal to the number of doom counters on it. 4: Remove a doom counter from Armageddon Clock. Any player may play this ability but only during any upkeep step.